Transparency Market Research (TMR) predicts that the global phosphorus trichloride market has the highest degree of competition. Key players such as Monsanto Co., Xuzhou JianPing Chemical Ltd., Rhodia, and Syngenta are some of the players operating in the global phosphorus trichloride market. In 2015, these players togetherly account for 28.42% share of the market. In order to retain their dominance, these key players are focusing on strategic collaborations and agreements with the end-use industries, which offer advanced products for strengthening their position in the market. These activities are anticipated to intensify the competition and consolidation levels in the market in the near future. According to TMR, the global phosphorus trichloride market is expected to value at US$1.92 bn by expanding with a steady CAGR 5.20% over the forecast period from 2017 to 2024. The market acquired a value of US$1.23 bn in 2015. 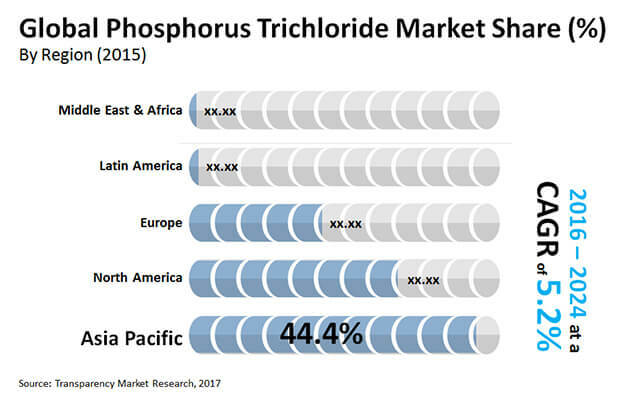 Based on the grades, the pure grade phosphorus trichloride segment dominated the global phosphorus trichloride market in 2015 with nearly 94%. Based on the applications, the agrochemicals segment dominated the market in terms of the demand for phosphorus trichloride and is expected to be dominant over the forecast period. Based on the region, the Asia Pacific dominated the global phosphorus trichloride market in 2015 by accounting more than 45% share and is expected to remain dominant over the forecast. This growth is attributable to the growing agrochemical and pharmaceutical sectors are boosting consumption among developing countries. Phosphorus trichloride is a concoction compound comprising of phosphorus and chlorine. It is a white to light yellow in shading with a sharp smell of hydrochloric corrosive. The item happens in its unadulterated normal structure and can likewise be produced artificially. It is basically utilized in concoction blend of organophosphorus mixes and is a forerunner to synthetic substances, for example, phosphorus pentachloride (PCl5), phosphoryl chloride (POCl3), and thiophosphoryl chloride (PSCl3). The global phosphorus trichloride market is significantly determined by developing interest for assembling product synthetic concoctions and agrochemicals. Organophosphonates are utilized in a different water treatment forms as cleaners, chelating specialists, erosion inhibitors and against scaling operator, which is probably going to drive the market development. The flooding interest for agrochemicals to meet the expanding utilization needs of quickly developing populace is another main consideration driving development of the market. It is a key fixing in the assembling of gas added substances, which is relied upon to move the market development because of high proficiency and better quality fill from car segment. In addition, the extreme interest for phosphorus trichloride as a plasticizer is further enlarging the market development inferable from their utilization in PVC for giving improved adaptability, versatility, and solidness. The item is a crude material to the medication named Sulfadiazine utilized for aversion of sicknesses, such as rheumatic fever, chlamydia, chancroid, and diseases such as Haemophilus influenzae. However, the chemical is classified as extremely toxic and corrosive under EU Directive, which is expected to challenge the market growth during the forecast period. Additionally, limitations from National Institute for Occupational Safety & Health (NIOSH) and Occupational Safety and Health Association (OSHA) are restraining growth of the market.